Tucson has always been one of my favorite travel destinations in Arizona. It is often overlooked in comparison to Sedona, Flagstaff and obviously Phoenix, but any chance I get to travel south I want to extend the experience. This past weekend we took a twenty-four hour trip to the dirty T, first it was for our Book Club, then we feel in the love with our AirBnB so we maximized the trip as semiprofesional tourists. Our morning of exploring started with breakfast at the 5 Points Market and Restaurant featuring local and organic products, I mean of course we are going to pay a dollar more for a local cage free egg. Duh! 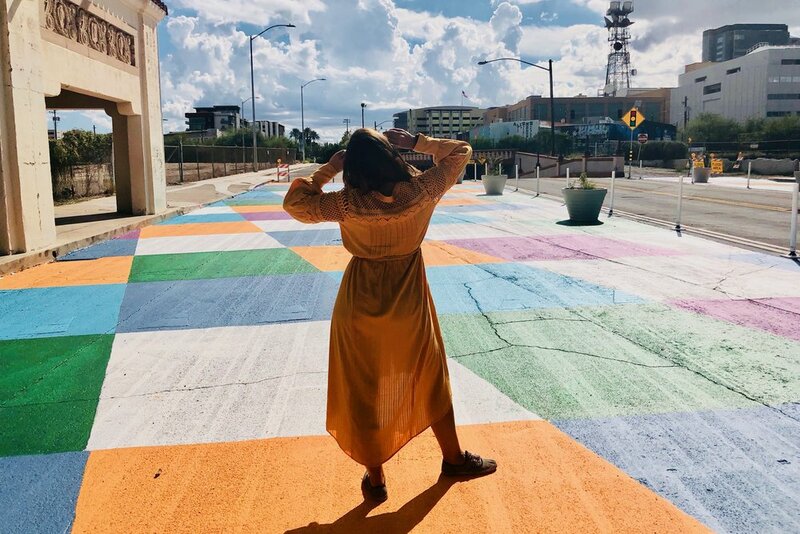 After treating ourselves to brunch and balancing 3 cups of coffee with a ginger beet juice we were off to explore Historic Fourth Avenue: The Heartbeat of Tucson. Featuring vintage clothing and furniture shops, food of all sorts and artwork decorating the streets this neighborhood is a millennials paradise for photos. One of the place that we historically had to take photos next to was the Tucson Postcard Sign. Painted in February 2017 by Victor Ving and his girlfriend, photographer Lisa Beggs this iconic piece can be found behind the Miller Surplus building and it worth the hunt for the photo shoot. 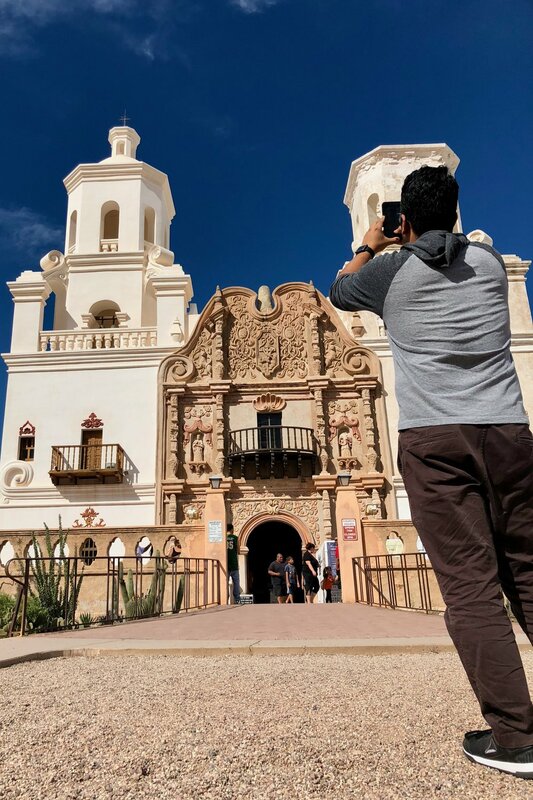 Before heading back up north, you must head south of Tucson to visit the gorgeous Mission San Xavier del Bac. 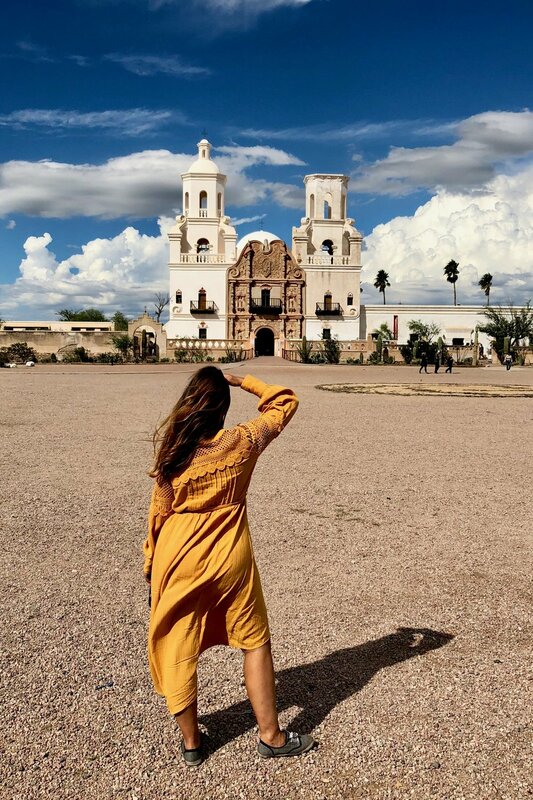 Founded in 1692 by Padre Eusebio Kino in the center of a centuries-old Indian settlement of the Sobaipuri O'odham this castle in the desert is a must see! We arrived mid Sunday afternoon just before a rainstorm and the contrasting dark clouds surrounding the white building was stunning. You have to walk the grounds and feel the 350 year old spirits. Not sure if it was the energy of the historic site or the fast moving clouds but we could feel it was time to head out. Last stop on the trip was for snacks! Not road snacks, but grocery shopping at the famous Alejandro’s Tortilla Factory: a Southern Arizona tradition since 1980. We picked up some warm delicious bolillos, fresh marinated carne asada and sweet mexican pastries. This bodegas is off the beaten path and the street signs measure in Kilometers so you know flavors are real. This is not our first or last trip to Tucson, we just like to prove no matter if you have 2 hours or 2 weeks you can experience the Old Pueblo the FInding Arizona Way! Safe Travels. Tucson, AZ is just a short drive from Phoenix, but completely another world. For Sun Devil’s it is almost forbidden territory, but for desert dwellers it is a hidden gem. 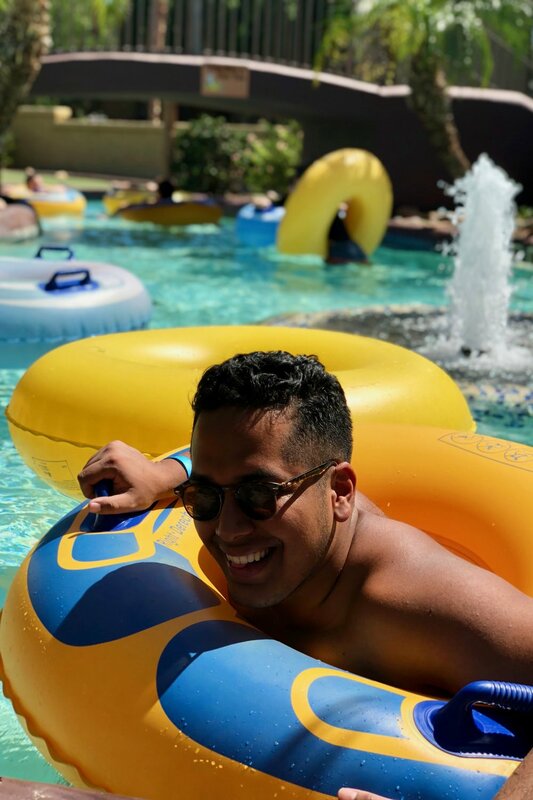 Quick day trips to Tucson was the usual agenda for us, but this time Jose and I wanted to take a mini vacay and extend out trip in the dirty T.
I quickly started looking up AirBnB.com for our trip. I didn’t want us to stay in a hotel with hundreds of other people seeking privacy. Browsing through most of the AirBnBs I avoided any couch crashing opportunities because we wanted a space of our own. Then we found The Desert Studio and I fell in love. This well designed space was the first thing that caught my eye. Upon our arrival, every expectation was met. This space felt particularly warm and full of love. Maybe it was the blush colored linens and art but it was a photographer’s and instagrammers dream. So of course we spent some time capturing the best elements of the space. First, the location of the house was prime! 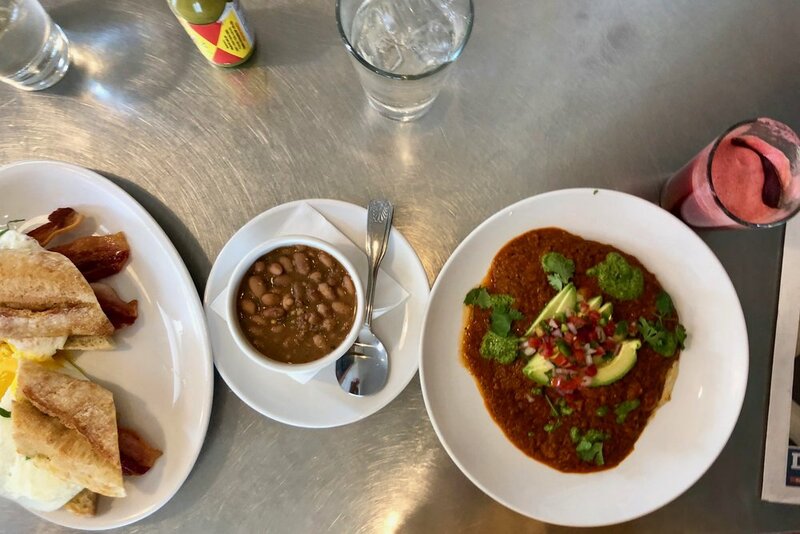 Located in the lovely Highland Vista Cinco Via neighborhood in Tucson, it was a 25 drive from our book club meeting near Marana (see previous post on the Book Club we joined), but less than a 10 minute drive to the Uof A campus and Historic Fourth Ave. The space a had a private entrance and everytime we pulled into the driveway it felt like we were coming home. Second, a space must serve purpose. The studio is well equipped with many amenities. (Mini -refrigerator, microwave, Keurig coffee maker, TV, and Wifi.) But our favorite use of the space was the record player. It was set with classic albums to enhance the experience. There is no better sound than a needle hitting the record and hearing that crackling spin. Lastly, bring on the accessories! Need a good selfie mirror?. Want to relive eighth grade English class browsing J.D. Salinger’s Catcher in the Rye? Dreamed of taking a photo in a Peacock wicker chair? Continuing the idea of functionality and purpose, each decoration enhanced the everyday experiences of conversation, reading and or sharing a meal at the quaint table for 2. If you are headed to Tucson, AZ you have to book this place! Looking to get out of town and experience a true AirBnB then reach out to Lauren And Kyle at The Desert Studio. The more I explore Arizona, the more I fall in love with it. Sometimes exploring is only 16 minutes from your house, but it feels like hundreds of miles away. Staycationing has become a popular trend and I understand why all the hype! Over the weekend Jose and I had the pleasure of staying at the Hilton Pointe Squaw Peak with endless amenities and all the chances to relax. The Pointe Hilton was an older resort, with Spanish charm and filled with lush vegetation. It is tucked away in the Squaw Peak Valley and surrounded by mountain peaks. Throughout the property you can find several water features leading you to various pools, restaurants, and activities. We lost track of how many great photo ops were around with the perfect lighting and the perfect backdrops. We stayed in a pool suite and took advantage of the views and the size of the room. It had the comfiest king bed dressed in clean white down linen, a private patio, and a separate living room with a queen sofa bed. Central air throughout the suite allowed us to also escape the triple degree heat outside and snuggle in the big comfy bed! Room service was what I was most looking forward too. What’s more romantic than breakfast in bed? After sharing buttermilk pancakes and building our own omelets we rested a few more hours before the fun! The food was warm and tased just like home. Plus the coffee was strong and the pot seemed bottomless. I felt bad leaving my dishes at the door but it was encouraged..
We couldn't wait to visit the water park and the mini golf course and we were thrilled to find that our room had four passes, so my parents, visiting from San Diego became our plus 2! 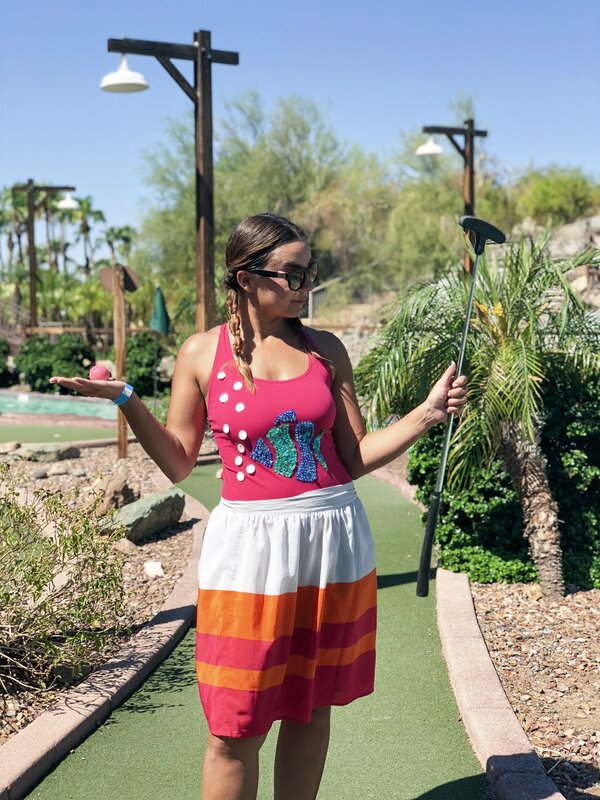 It reminded me of my childhood vacations in Palm Springs or Arizona when we could only complete a few holes before needed to take a dip in the pool to cool off. It is amazing to think that these favorite memories are ones I am still looking to relive as an adult: sunshine and swimming! Time went too quickly and soon it was time to turn in our towels and keys and check out and head back to reality, Escaping 16 minutes away overnight was much more than it sounds. We appreciate the Hilton Pointe for letting us escape our minds for 24 hours.